Our Acetone is 99.6% pure. Acetone is often the primary (or often the only) component in nail polish remover. Ethyl acetate, another organic solvent, is sometimes used as well. Acetone is also used as a superglue remover. 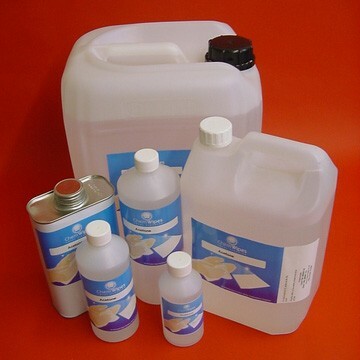 It can be used for thinning and cleaning fibreglass resins and epoxies. It is a strong solvent for most plastics and synthetic fibres. It is ideal for thinning fibreglass resin, cleaning fibreglass tools and dissolving two-part epoxies and superglue before hardening. A heavy-duty degreaser, it is useful in the preparation of metal prior to painting; it also thins polyester resins, vinyl and adhesives. It easily removes residues from glass and porcelain. In biological research contexts, buffers that contain acetone (such as citrate-buffered formalin) use the acetone to lyse cells for further experimentation. Additionally, acetone is extremely effective when used as a cleaning agent when dealing with permanent markers. Also available in 5L containers, please contact us direct for more information.